The launch of our training programmes in Fisantekraal in April this year coincided with our decision to become a member of Poverty Stoplight. Poverty Stoplight is an approach used to measure aspects of multi-dimensional poverty in the families of the beneficiaries being served to gain greater insight into the real needs of the community. The tool will help us to measure the impact that we are having in the families we serve over a period of 3 years. It will also provide the data needed to prioritise and develop initiatives that speak to the real needs of our beneficiaries. “Poverty Stoplight is an approach that helps people progress out of poverty by empowering them to understand and map their own choices. It encourages households to participate and own their own journeys out of poverty, and provides a clear line of sight of how to get there; at the same time allowing organisations delivering support to measure progress against their programme objectives.” Says Laura Bergh, Chief Enabler of the Poverty Stoplight Office. The tool uses stoplight colours, photographs and simple software to enable the poor to see and understand the ways in which they are poor. For each of the 50 indicators, there are three status conditions – VERY POOR, POOR and NOT POOR. Cheryl van der Merwe and an FCD graduate from Fisantekraal who has recently qualified as an Auxiliary Social worker, attended the Poverty Stoplight training in April. Dianna has been appointed by FCD to conduct the interviews which are done during household visits with as many members of the family present as possible. The family completes the survey on an Android device, by selecting the definition of each indicator that most reflects the family’s current circumstances. Through this process, a scorecard is created for the family that allows them to reflect and plan how to resolve the poverty related problems affecting them, with the help of FCD and other organisations that have competencies relating to each indicator. Laura says that “data can be aggregated and mapped using online geo-referencing, offering a better perspective of the real issues at hand in specific areas of the country, and scaling for a national snapshot in time. These maps can enhance decision-making for government services such as electricity and sanitation and can influence priorities for engagement. Similarly, the corporate social investment sector could use these maps to identify the issues of greatest need within their geographical footprint”. 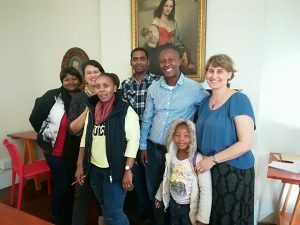 We’re excited about the long-term benefits that this project can produce and look forward to working more closely with other NPOs working in the greater Cape Town area to make a significant progress towards the eradication of poverty in South Africa.